Iran has ignored the latest UN deadline to suspend uranium enrichment and is actually extending it, a report by nuclear watchdog the IAEA has said. The refusal to observe the Wednesday deadline could lead to further UN sanctions against Iran. The US described Iran's non-compliance as a "missed opportunity for the Iranian government and Iranian people". An Iranian official said UN demands to end enrichment were unacceptable as they had no legal basis. While enriched uranium is used as fuel for nuclear reactors, highly enriched uranium can also be used to make nuclear bombs. The report, written by agency head Mohamed ElBaradei, said Iran had not only failed to stop enrichment but was expanding the scale of its enrichment programme. Iran denies Western claims it is secretly trying to build nuclear arms, saying its nuclear programme is for purely peaceful, energy-producing purposes. "Iran considers that a suspension of uranium would be contrary to its rights, to the Non-Proliferation Treaty and to international rules," the deputy head of Iran's nuclear agency, Mohammad Saeed. The best way to solve the dispute was to return to the negotiating table, he said. But US State Department spokesman Tom Casey said the UN Security Council should now consider fresh sanctions in addition to measures targeting its nuclear and missiles programmes imposed by the UN in December. The BBC's Jonathan Beale in Washington says senior US diplomats are now in contact with other members of the UN Security Council to try to ratchet up the pressure. UK Foreign Secretary Margaret Beckett said Britain remained determined to prevent Iran acquiring the means to develop nuclear weapons, but was "committed to a negotiated solution". The six-page IAEA report said there had been little progress in clearing up outstanding questions about Iran's past nuclear activities and urged the Iranians to be co-operative. 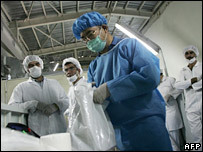 It said Iran had expanded from research-scale to industrial-scale production of enriched uranium. Two cascades of 164 centrifuges each had been installed at the enrichment facility in Natanz, with two more close to completion, it said. A total of 3,000 centrifuges are expected to be installed in the coming months. Iran was also building a heavy water reactor and heavy water production plant in defiance of the UN Security Council, the report said. It added that Tehran had agreed to interim IAEA verification procedures but not to remote monitoring at the plant, the report said. There would be a breach of non-proliferation safeguard rules once there were more than 500 centrifuges.